If you haven't had the chance, you might enjoy all the comments that have come in through our facebook page (www.facebook.com/eriebenedictines) with the death of Sister Christine. There are some very nice things that come via facebook and this is certainly one of them. See our community website for links to her obit et al. My cousin, who fell in love and married a Canadian a number of years ago, lives about 3 hours from Erie now but comes back regularly to visit family and friends. She is naturally very funny and admitted to me last week at a Lighthouse Restaurant lunch we were sharing during her September visit, that her funniest story these days is telling everyone about her cousin, "the nun," down in the states whose community has a fleet of cars, asking them to guess what car is the most popular. Then she says, "They're KIA souls....a group of nuns all driving 'souls'!" Even I agreed that it is funny...but they are great cars for our need and lo and behold, last week we got a new one: here it is lime green. I guess it's probably # 8 or 9---we have white, black, grey, green, pumpkin orange and now lime green. Some wild grapes along the Troupe Rd. woods between our place and Benetwood Apartments. The wooded lands throughout our property are full of end-of-summer and early fall "things" of every sort, color and type. If there was ever a time for a walk in the woods, it is now. This Saturday a professional photographer is offering a photography workshop to us. I hope to learn some things! Meanwhile, I was just walking around on what felt like an average day and came upon these shots I wanted to share. I'm not suppose to call these wild turkeys "ugly" so I'll say, "Look at these unusually homely birds that were walking through our yard today." Our temperatures have been very cool in the mornings (48-50) and then warm during the day (70+) so we saw this unusual "mist" coming off the backyard grass about 7:30 pm as the air was quickly cooling. I was walking through the chapel at about 12:30 pm, right after lunch, and caught what to me were the stained-glass windows in a new light. (Pun intended, I guess). If you look at the photos in the far right column you'll see that I usually see the windows reflected on the ceramic tiles, with curves and shapes all over. Today all there was were long straight lines of color...absolutely nothing to indicate that the light was coming through hundreds of small squares, rectangles and numerous other shapes. However, then I caught sight of the floor and another equally unusual sight, near perfect windows with few distortions. WOW.....they continue to astonish ! This was a busy, busy weekend with many and diverse events offered. Here are two I attended. On Saturday our Monasteries of the Heart program sponsored its first webinar. With the help of local PBS station WQLN, they offered a nearly 2-hour event that was live streamed on the web. Sister Joan C. gave a presentation on love, forgiveness, reconciliation and compassion. Following a 15-minute break she returned for a 15-minute Q & A on questions emailed in from viewers. It was a very successful venture which promises more in this venue. Sunday was an international day of action for climate change. Events all over the world took place this weekend, including here in Erie Sunday afternoon. Originally planned for outdoors at Perry Square, high winds and possible rain showers sent it inside at nearby Gannon University's former library, the Yehl Room, which turned out to be a more than worthy substitute. The crowd was large, the displays excellent and varying, covering all aspects of climate and environmental concerns for our Lake Erie area. A number of our oblates and sisters were on the planning committee. Congratulations to them on a great city/region-wide event. September 17 we celebrated the feast of Hildegard of Bingen: abbess, spiritual counselor, physician, theologian, writer, reformer, preacher and composer. Quite the woman! And this was in the 12th century. In our own community we have a Hildegard of Bingen Music Studio in the lower level, south hall. Our first hermitage, the one nearest East Lake Road is named Hildegard--though we also call it Hermitage #1. 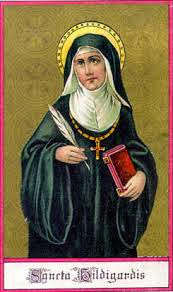 In our history we had a Sister Hildegard Altstadt who died young, age 16; Sister Hildegard Coldon died in 1911; Sister Hildegard Denny didn't stay, but she had the name for a bit; and we had some Sister Hildas and Sister Hildegunds, are they derivations of this saint? To listen to some music credited to her or her inspiration go to youtube here. I believe this is a lavender plant. It's at Benetwood Apartments. With our pre-autumn weather settling down for the afternoon, we celebrated royally with our five Golden Jubilarians for 2014. If you haven't been to our website yet, you can see them here. We were expecting 300 guests adding to 100 of us---and I think everybody showed up. Great Evening Prayer service with renewal of vows, delicious food at the reception provided by our own kitchen staff (transformed into their catering mode) and lots and lots of conversations, laughter and enjoyment in each other's company. Anne's reflections at the prayer are here if you haven't read them. Afterwards the celebrants all had a gathering for family and friends, especially for those who have traveled from out of town. One of the parties was held at a small place just south of us but with a considerably higher elevation. Here's the view of the sunset we got from their deck. We will celebrate gloriously this weekend with our five Golden Jubilarians. 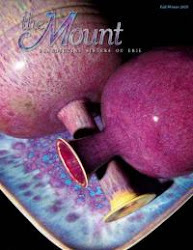 If you missed the story about them in the MOUNT magazine, now's the time for you to catch up. Go here, scroll down to the magazine in the left hand column, click, give it a minute to load and you'll find the Jubilarian stories beginning on page 12. Here is a sneak preview of the chapel environment that went up today. For those of you who know our chapel I believe this is the first time we've had anything as part of a celebration hanging from the rafters! This is our little golf course: Lakeside. Located right on the PA/NY border on Rte 5. It is what I would call a "country" 9-hole course. Well-kept, but not too much, gravel paths for carts, grape fields bordering three sides, a creek running through and 3-4 holes with little ponds. It's a beauty. These are all scenes from Lakeside golf course. I love Mary Oliver's poetry first because I am a nature lover and secondly, because they are so spiritual. What if a hundred rose-breasted grosbeaks flew in circles around your head? What if the mockingbird came into the house with you and became your advisor? What if the bees filled your walls with honey and all you needed to do was ask them and they would fill the bowl? What if the brook slid downhill just past your bedroom window so you could listen to its slow prayers as you fell asleep? What if the stars began to shout their names, or to run this way and that way above the clouds? What if you painted a picture of a tree, and the leaves began to rustle, and a bird cheerfully sang from its painted branches? What if you suddenly saw that the silver of water was brighter than the silver of money? What if you finally saw that the sunflower, turning toward the sun all day and every day--who knows how, but they do it--were more precious, more meaningful than gold? Throughout the year the position of the sun varies when we are in chapel for prayer: Mornings 6:30 or 8:30 a.m. and Evenings 5:30 or 7:00 p.m. Some weeks the sun is just perfect for illuminating our stained glass windows and/or throwing reflections of the glass onto the ceramic tiles. This is one of those times--but not for the large north and south windows that are so obvious, but instead for the seven thin windows set into the west wall. These are ones that are hardly noticed, I'm sure, by most of us--residents and guests alike. It is very hard to take a photo of them. I'd like to be ten or twelve feet up so that we could catch them straight on. Additionally, they are so thin and long that they don't make a standard size photo. Undaunted we keep trying and here are the best of today's attempts. This is the smallest of the seven. I don't know why the border came out black! I was experimenting with settings and this turned out! This is the one closest to the floor and therefore easiest to take a photo of. The window is the right side and its reflection on the ceramic shadowbox type setting is on the left. On a lighter note, we couldn't resist running outside into our library courtyard when we saw none other than Minnie Mouse bobbing up and down behind a tree. Someone lost a birthday balloon and she landed right here!